Karsten Warholm racing in the 2017 Bislett Games. Only 10 months into his reign as world champion, Karsten Warholm has already been surpassed by Abderrahman Samba from Qatar. “We will never give up. This is why we do this,” is the message from Warholm and his team. Warholm set a Norwegian and Nordic record in the 400-meter hurdles, when he ran 47.81 in the Golden League race in Stockholm, June 10. This broke the record of 47.82 he set in the Diamond League season opener in Rome on May 31, which eclipsed the 47.96 Sven Nylander ran in 1996. Warholm is the favorite to win the European Championship in August. He has never been better, but he is still only second best. Samba beat him by 40 hundredths of a second. This was the third time in a row, in one and a half weeks, that Warholm has been beaten by Samba. Warholm’s coach, Leif Olav Alnes, who was given the “Norwegian Coach of the Year” award last season, is still satisfied. “Last season we would have done backflips from pure joy if he ran 47.81,” he says. 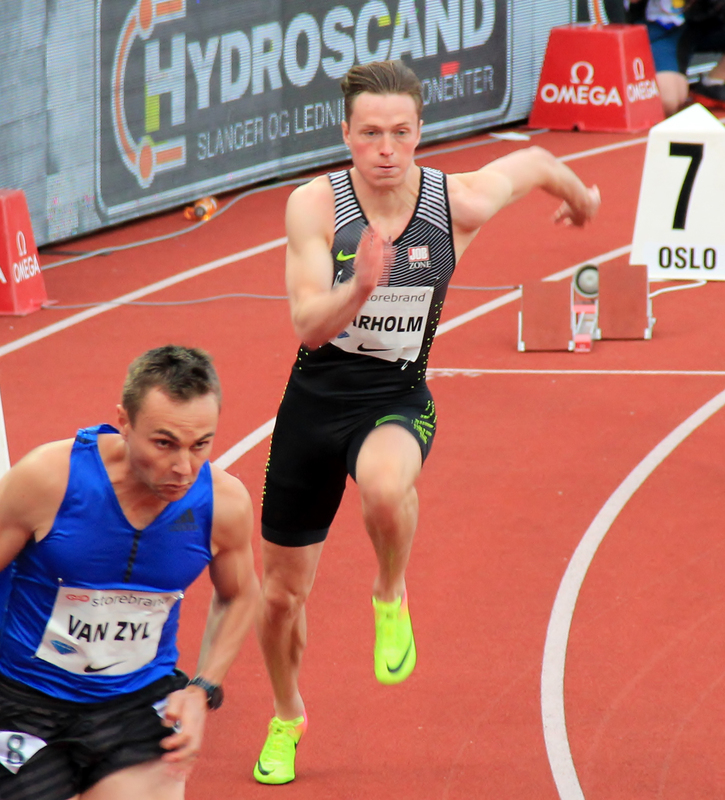 Warholm’s best time last season was 48.22, at the Golden League event in Zürich. Samba, however, is the other way around. Warholm has been leading in all three races, but Samba has been superb in the last 100 meters, totally crushing all opposition. He has seemed to have an extra gear or two toward the end. “He has been in a league of his own,” Alnes admits. Samba grew up in Saudi Arabia and played both soccer and basketball before moving to Qatar four years ago to pursue track. He represented his new home country in Barcelona in 2016 in the 200 meters. Samba’s agent, Swede Daniel Wessfeldt, who also represents the Norwegian Ingebrigtsen brothers (Filip, Henrik, and Jakob), says that Samba has unlimited resources available to him in Qatar. Another runner who has been doing extraordinarily well on the 400-meter hurdles this season is 20-year-old Rai Benjamin from Antigua and Barbuda, who set a personal best of 47.02 on June 9. He competes for the University of Southern California. This article originally appeared in the July 13, 2018, issue of The Norwegian American. To subscribe, visit SUBSCRIBE or call us at (206) 784-4617.